Pennsylvania, the fifth most populous state in the United States,  is the birthplace or childhood home of many famous Americans. People from Pennsylvania are called "Pennsylvanians". 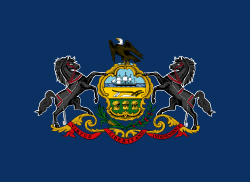 The following is a list of notable Americans who were born and/or lived a significant portion of their lives, in Pennsylvania, along with their primary Pennsylvania city or town of residence. John Stuchell Fisher, 29th Governor of Pennsylvania— South Mahoning Twp. ^ Sources cited in her article state that her studio is in Pittsburgh, but not whether she lives in the city itself. ^ "A College President, Drawn to Uncertainties". New York Times. 2013-08-25.